Aplimentec Foundation trough DWASH-USAID has supported community in 9 locations district Manatuto to construct more than 506 household’s toilets. The project was completed in last November 2011 with the celebration of Open Defecations Free (ODF) justification for each location. The latrines construction process use CLTS (community lead total sanitation) methods that encourage and enable community to build their latrines based on voluntary awareness. 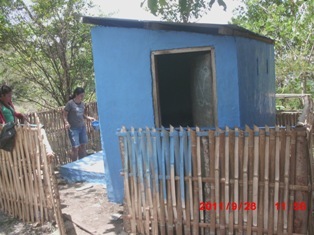 Most of the construction utilized local materials with a technical latrine construction support from Aplimentec and DWASH sanitation experts. The toilet construction was run in 9 sub villages covered 4 sub villages (Orlalan, Manelima, Batara and Manehat) in sub district Laclubar-Manehat, district Manatuto. Most of the areas are located in rural sites. The project has provided benefits for more than 3000 populations covered 506 households. According to CHC (community health clinic in both sub districts) the project has reduced more less 60 % of diarrheas diseases in each location since the project started in April 2011. DWASH-USAID will close down the project by end of January 2012 after 3 years operated its project in district Manatuto. (Lino/Jo).